GDP is the total market value of all final goods and services produced in a country in a given year. To make meaningful comparison, PPP is used to compare economies and incomes of people by adjusting for differences in prices in different countries. 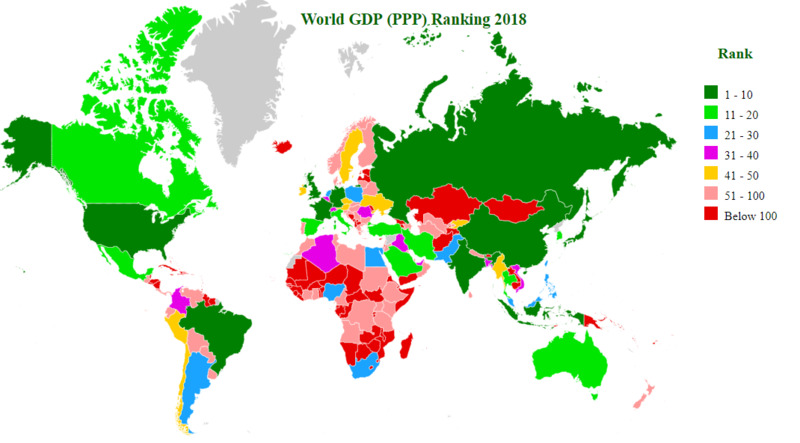 According to data provided by IMF Outlook (April-2015), China overtook United States as the world’s largest economy in terms of purchasing power parity (PPP). GDP of China stands at $17.6 trillion international dollor. China contributes 16.32% of total economic output. In 2013, GDP of United States was $595 billion more than China. In 2014, ecomomy of China has expanded by $1,444 billion compare to United States of figure $651 billion. Now China is ahead of United States by only $198 billion. India remains at 3rd largest position having economy of $7,376 billion. Top ten countries are : China, United States, India, Japan, Germany, Russia, Brazil, Indonesia, France and United Kingdom. In the list of 10 largest economies, 4-4 countries are located in Europe and Asia continent and 1-1 countries is located in South America and North America continent. China and United States contributes 32.46% of world's GDP. Top 3 countries contributes 39.3% of world's GDP. Top 5 countries shares 47.15% of world's GDP. Top 10 countries contributes 60.71% of world's GDP. Change in Ranking: Apart from United States and China, another interchange in ranking took place between Indonesia and France. Now, Indonesia is 8th largest economy of the world on ppp basis. Mexico displaced Italy while Saudi Arabia displaces Canada to occupy 11th and 14th position. Continent-wise - Top 3: Asia : 1. China, 2. India, 3. Japan. Europe : 1. Germany, 2. Russia, 3. France. North America : 1. United States, 2. Mexico, 3. Canada. South America : 1. Brazil, 2. Argentina, 3. Colombia. Africa : 1. Nigeria, 2. Egypt, 3. South Africa. Oceania : 1. Australia, 2. New Zealand, 3. Papua New Guinea.